Elegant, large and heavy pair of sterling silver wine goblets made by Gorham. they are 5 1/2" tall, the diameter of the top is 2 3/4" and the diameter of the base is 2 5/8". the total weight is 13.49 Troy oz. No Monogram. Chantilly Grand Gravy Boat with Underplate Sterling Silver By Gorham The Gravy Boat is 8"L X 3 3/4"W X 4 3/4"H, 10.6 OZT and the UNDERPLATE is 8 1/2"L X 6 5/8"W, 8.1 OZT. Both are monogrammed with the same monogram pictured and both are in excellent condition. The date mark on the Gravy Boat is 1911 and there is no date mark on the underplate also pictured. Offered is this handsome sterling silver covered soup tureen or vegetable dish, made by Gorham, C.1896. The condition is wonderful; the pattern is clear with nice oxidation. The pattern is very similar to the Gorham Chantilly pattern. The condition is wonderful - There is a very minor ding on the rim of the cover. This 2-handled tureen sits on a short, shaped, oval pedestalled base. The overall height is 9"; the diameter (over the handles) is 14 3/4"; the weight is 58.32 Troy Oz. There is a beautiful date in one cartouche and a beautiful intertwined script monogram in the other. This is an antique, exquisite Gorham Sterling Silver SUGAR SHAKER, C.1892. The height is 5"; the diameter of the top is 2 1/8"; the width at the center is 3 3/4". The weight is 5.58 Troy Oz. There is very small impression on the bottom which is pictured. Fabulous Art Nouveau in look but with Greek in design Sterling Silver Sugar Or Candy Bowl by Gorham Co. No monogram, in excellent condition and professionally polished. The base is oval connected to the bowl with a decorated oval band. There is an elaborate designed band around the bowl and under the the top curved lip. The length from handle to handle is 8 7/8", width is 4 1/2", the height is 4 1/4" and the weight is 17.28 Troy Oz. Chantilly Grand by Gorham Sterling Silver 3-PC Pepper Shaker, Open Salt & Spoon The Pepper Shaker: Height is 4 3/4", width 2 3/4", weight is 2.84 Troy Oz. Mono with single letter. The Open salt : Height is 1 3/4", width 3 1/4", weight is 2.18 Troy Oz. Mono with three letters. The spoon has the newer Gorham mark as pictured. The set is in excellent condition . All marks and monograms are pictured. All measurements are approximate. 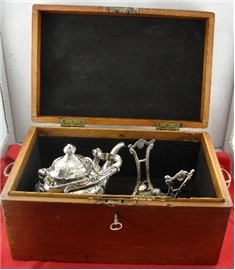 BEAUTIFUL GORHAM PIERCED STERLING SILVER BASKET WITH UNUSUAL FOUR FOOTED OVAL BASE. The length is 8 1/2" and the height is 3 3/4", the weight is 8.79 Troy ozs. Monogrammed.